I'm needing the fan control module for a '93. This is the small module with a power transistor and heat sink that is mounted under the dash in front of the blower fan for the hvac and just behind the glove box. Gm can you post a pic,I might have it. I don't have possession of it right now but it is about 2.5" square and about an inch thick with a large round power transistor mounted on a heat sink on one side of the module. I can't tell for sure and I don't have access to it right now. How thick is the heat sink under the transistor? Edge view? More views at Bill's link as I recall. That looks like it. How much? See my reply above - call Bill at SCP. I was just trying to help you ID it. Last edited by KMT; 08-26-2018 at 01:12 PM. 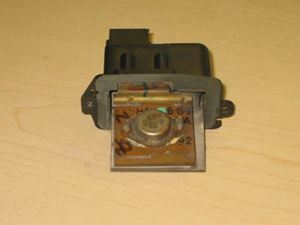 WTB: '93 SC Blower Control Module FOUND! !